Using Second Life for modeling is not new, but I thought this build coming out of Iowa State was unique. 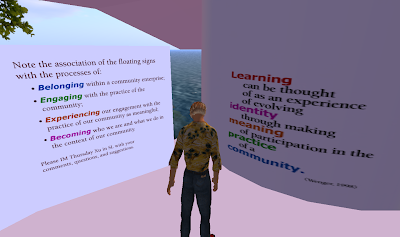 When I was wandering through the model it occurred to me that we could be using Second Life as a personal and collaborative mind-mapping sort of environment. A collaborative "thinking out loud" sort of space. This would be an example of using the tools of the Second Life environment as the learning space. Not just describing existing models in 3-D, but actually collaboratively constructing new models. When I was walking through the model I was thinking, "It would be nice if the path were wider so you could more easily walk through it with another avatar. I also thought about how Wenger's model (as presented) is much more focused on teaching than it is on learning. Maybe I wouldn't have realized this if it were presented in its old 2-D form.